International Women's Day is celebrated on March 8, 2019.
International Women’s Day falls on Friday, March 8 across Canada. This day is an opportunity to celebrate the many achievements and contributions of women on our campuses, in our community, and worldwide. The national theme for International Women’s Day 2019 is #InnovateForChange. Innovation and technology can help empower women and girls. There is a growing digital divide, however, and women are still underrepresented in STEM (Science, Technology, Engineering, and Math) fields. This year’s theme challenges us to decrease barriers facing women in STEM and use the power of technology to create a more equal society. Dalhousie Medical School has a long history of encouraging women in medicine. In 1881, at a time when most medical schools were refusing entry to women, the medical school’s leaders spontaneously voted to encourage women to pursue careers in medicine—even though no women had as yet applied. The first woman to graduate from Dalhousie with a medical degree was Dr. Annie Hamilton, in 1894—she was one of few in the school’s early history. Many women have played senior roles on the medical school’s leadership team in recent decades. Some of the outstanding examples include Dr. (Sister) Nuala Kenny, who headed the Department of Pediatrics and founded and led the Department of Bioethics; Dr. Karen Mann, who was internationally known for her contributions to medical education in her longstanding role as associate dean of undergraduate medical education; and Dr. Noni MacDonald, who was the first woman in Canada to become a dean of medicine (1999 to 2004) and continues to show international leadership in the fields of global health and infectious diseases. Like last year, we're taking a moment to spotlight some of the women we're inspired by. These five women all accepted roles at Dalhousie Medical School, each bringing her own unique and broadened background to the Faculty of Medicine. Outstanding role models that they are, they share their insights and wisdom about succeeding in a challenging field. Jenna has been named an Academic All-Canadian four times, most recently during her first year of medical school. Also a Dean’s List student, she received the Dr. Lilyan E. White and Dr. W.K. Honig prizes, as well as the John Richard Freeman Warr Memorial research award, during her time in the undergraduate neuroscience program. Having been a member of the cross country team since her undergrad days, she says she simply continued with an established routine after starting her medical studies. 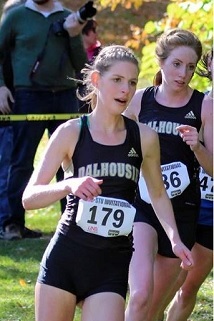 While an injury has resulted in her being unable to compete on the varsity cross country team in 2018-19, she’s stayed in touch with the sport by coaching with Doctors Nova Scotia’s Kids Run Club, helping participants train for June’s Scotiabank Blue Nose Marathon. Jenna is also an instructor with Swimming With a Mission (SWAM), a not-for-profit student-led program that provides affordable and accessible one-on-one swimming lessons to children with special needs, and is an in-school mentor with Big Brothers, Big Sisters as part of her Service Learning Program. 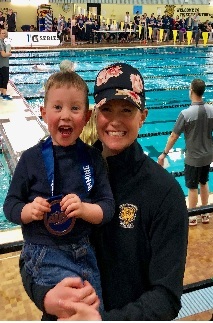 Stephanie Dennis has balanced motherhood, a place on the varsity swim team and volunteer speaking engagements with the Canadian Armed Forces during her three years of medical school and even managed to compete at the 2016-17 AUS championship while five-and-a-half months pregnant with her daughter. Despite all the benefits of being on the swim team, Stephanie describes her first semester of clerkship rotations as the “hardest thing I’ve ever done.” A typical day started with her waking up at 4:30 a.m. in order to arrive at the hospital for 5:15 a.m. She’d get home at 6 p.m., just enough time for bath-time, story-time and bed-time with her two kids before heading out to the Dalplex pool to swim from 7:30 p.m. until 9 p.m. After returning home, Dennis would study for an hour and then go to bed, ready to do it all again the next day. 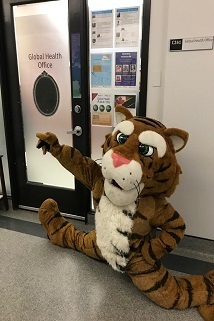 Sarah wears many hats in the Faculty of Medicine’s Global Health Office, which includes managing the school’s Service Learning Program and Local Global Health Elective. Currently, this means leading the planning and implementation of the Faculty’s first-ever Community Volunteer Day for staff and faculty as well as collaborating with students on events which serve to enhance their learning related to health equity and the social determinants of health. It should come as no surprise then, that Sarah is also an accomplished salsa and bachata dance instructor who has used her skills on the dance floor to teach classes in order to support student projects with our community partners. In fact, if you ever see the Dal Tiger dancing the salsa, you can be fairly certain it’s Sarah in costume. 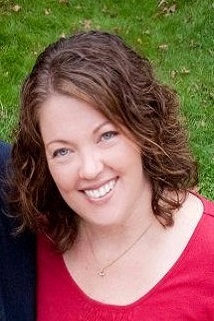 For the past two years, Tanya has been the Managing Director for the Centre for Collaborative Clinical Learning and Research (C3LR), a simulation and experiential learning centre that focuses on and encourages interprofessional learning, serving the Faculties of Medicine, Health and Dentistry. With a Bachelor’s Degree in Physiotherapy from Dalhousie University and a Masters in Rehabilitation Science from McGill University, Tanya has an extensive health care background as a health care provider and a formal leader within the health care system. Before completing her Master’s Degree, Tanya took the opportunity to travel, live and work in Kuwait on a Dalhousie development project, teaching local physiotherapists the ways of the Canadian health system. After graduation, she took a management position within the health district and was responsible for managing multiple disciplines across many sites. In her last seven years with the health authority, she led interprofessional practice and team structures, including student placement processes and facilitating interprofessional clinical experiences. As a former clinician and leader in the private and public health sectors for the past 28 years, Tanya’s passion for interprofessional practice and the power of collaborative teams became a focus of her work. Given her impressive background in health sciences, you might expect to see Sara at the front of the class, mid-lecture. After all, she completed her Master’s degree right here in Dalhousie’s Faculty of Medicine in 2002. Sara’s MSc hails from the Department of Microbiology and Immunology, focusing her interst and thesis on the area of yeast molecular genetics. 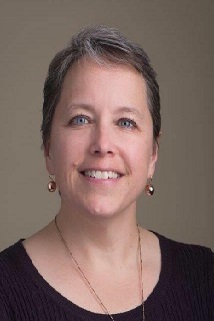 However, since August of last year she has taken the helm as Director of the Medical Research Development Office, where she provides strategic counsel and administrative leadership to advance the research objectives of the Faculty’s strategic plan, #DalMedForward. It was during grad school that Sara realized she wanted to stay in the research world. In 2003, she began a position as a Clinical Research Coordinator supporting glaucoma research in the Department of Ophthalmology and Visual Sciences. Eager to explore a deeper side of research administration, she took a positon with Research Services (at what is now NSHA) as the Coordinator of Contract Facilitation and Support. In 2010, she came back to Dalhousie as a Research Grants Facilitator in central Research Services, where she grew and developed her career as a research administrator. With the support of Research Services, she began a secondment with the Faculty of Health in January 2018 as the Interim Director of Research Services, a positon where she was able to transfer her skills and experience into a role with a larger scope, and more diverse responsibilities. Mother of three, including two young girls, Sara Lavender believes women can often face very different obstacles when it comes to pursuing careers in medicine than their male counterparts and wants to see society doing more to support women along their career journeys. With that in mind, she leads by example. To read more about women in science and leadership at Dalhousie Medical School, check out “Women step into more senior leadership roles at Dalhousie Medical School” published in Dal Med News on International Women’s Day 2018.